The first new Tolkien novel for 30 years is to be published next month. 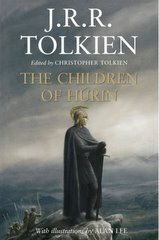 In a move eagerly anticipated by millions of fans across the world, The Children of Húrin will be released worldwide on 17 April, 89 years after the author started the work and four years after the final cinematic instalment of the Lord of the Rings trilogy, one of biggest box office successes in history. Amazon has it available for pre-order — and the publication date is not April 1.